If you read my last blog post, you know that we found out that our youngest needed vision therapy, but the price tag was beyond what we could afford. Immediately after that revelation, I took my kids to gymnastics, where a former-OT friend informed me that she had been given a whole binder full of vision therapy exercises during her time working in a low-income school in South Africa. A while back, I had the brilliant idea of crafting responsibility charts for my kids. I was getting frustrated with doing little tasks that my children could easily do for themselves—putting their dirty clothes down the laundry chute at the end of the day, for example, or cleaning up the cascade of books in front of the bookcase. A responsibility chart sounded like a brilliant solution to my woes. After doing some pricing and finding nothing to meet my specific needs or price point (uber cheap! ), I hunted around online for ideas. I settled on this one from Spoonful.com—in part because it used materials that I already happened to have around the house, and in part because it didn’t have any markers or magnets that could mysteriously disappear, rendering the chart useless. My kids are young, so I made their responsibilities minimal. Every day they need to put their jammies under their pillows when they get dressed, clear their dishes after every meal, clean up their toys and books at the end of the day, and put their dirty laundry down the chute. Mommy’s problems were solved…or so I thought. The first three days were great. The kids were so pumped about their charts that they remembered all their responsibilities, gleefully sliding that straw from “To Do” to “Done!” On days four and five, they would remind each other about their responsibilities…and Mommy would occasionally need to point to the charts when neither big kid seemed to remember. On day six, the realization struck. Those responsibility charts? They’re really for Mommy. After all, I SHOULD have been reminding them to clean up after themselves all along. Isn’t that my job as a Mom? To teach them the skills they’ll need as they grow and to help them develop into responsible human beings? At barely-five and almost-four, my kids aren’t always going to behave responsibly. They’re going to jump on the couch, forget to say “thank you”, paint their little brother’s hair, try to hog all the train tracks… But that’s where I come in. At the beginning, my guidance has to be perpetual; gradually, I can step back and let them take the lead, nudging them when they forget or fail. Here’s the thing about being a Mom: it’s endless. I think that’s both the most rewarding and the most daunting part of it. If I start slacking off in my vigilance, neglecting to remind them to be polite or clean up after themselves, then they start to slip. If the good habits aren’t perpetually reinforced, they seem less important. So those responsibility charts? The kids never touch them anymore. But that’s okay; they’ve served their purpose for Mommy. Our basement is home to a sixteen-year-old relic of a water heater. The beast was inefficient when it was purchased (I think the “your model” indicator on the Energy Star label is in the “so inefficient you may as well go out back and boil your water over your fire pit” realm); it now treats us to the auditory equivalent of a Fourth of July fireworks display every time we deign to use a bit of hot water. Before we find ourselves shivering in the shower because our friendly beast has quit working, we thought we’d look into finding a replacement. .65 = our local plumbing supply store’s standard model. The difference between the local standard and the internet standard is .12. This efficiency difference divided by .04 is 3. For each year I run this model, I would save 3x$11 or $33 over the internet standard. Over the 13-year life of the water heater, I would save $429 over the internet’s .53 model. .90 = our local plumbing supply store’s high-efficiency model. See that? Our old water heater’s rating was as far to the right on the efficiency line as this one is to the left. Hooray for energy savings! The difference between the local high-efficiency and the internet standard is .37. This efficiency difference divided by .04 is 9.25. For each year I run this model, I would save 9.25x$11 or $101.75 over the internet standard. 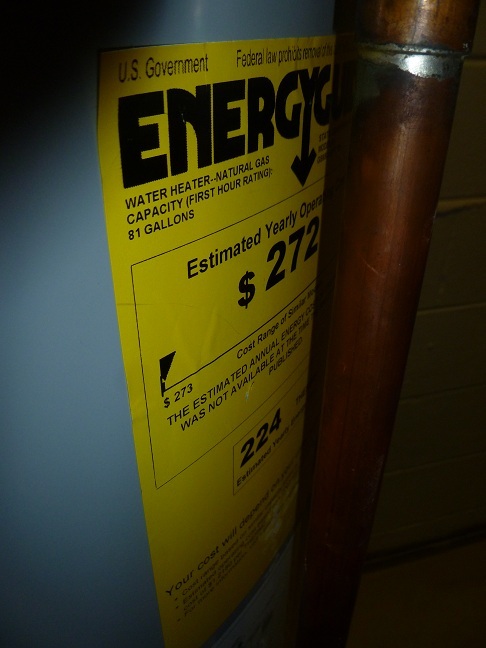 Over the 13-year life of the water heater, I would save $1322.75 over the internet’s .53 model. Over the 13-year life of the water heater, I would save $893.75 over the store’s .65 model. .95 = our local plumbing supply store’s ultra-high-efficiency model. The difference between the local ultra-high-efficiency and the internet standard is .42. This efficiency difference divided by .04 is 10.5. For each year I run this model, I would save 10.5x$11 or $115.5 over the internet standard. Over the 13-year life of the water heater, I would save $1501.50 over the internet’s .53 model. Over the 13-year life of the water heater, I would save $1076.50 over the store’s .65 model. Over the 13-year life of the water heater, I would save $178.75 over the store’s .90 model. The plumber will install the standard .65 water heater for $825. He’ll install the efficient .90 water heater for $1200. That’s a $375 cost increase for a savings of $893.75. The ultra-high-efficiency water heater is $1700 installed, which is a cost increase of $500 for only $178.75 additional savings. Can you guess which water heater I ordered? Bonus Update: I waited until we got the new .90-rated beauty so I could include a picture. At today’s visit, the plumber said our water heater was such an easy install that he’s knocking $100 off the price, and oh-by-the-way the utility company has a $150 rebate for efficient water heaters like ours. So make that a $125 cost increase for nearly $900 savings. Wa-hoo! Once upon a time, someone gave us some paint. It was a set of those little plastic pots, the ones that come all linked together with flip-down lids so you can re-use the paint. 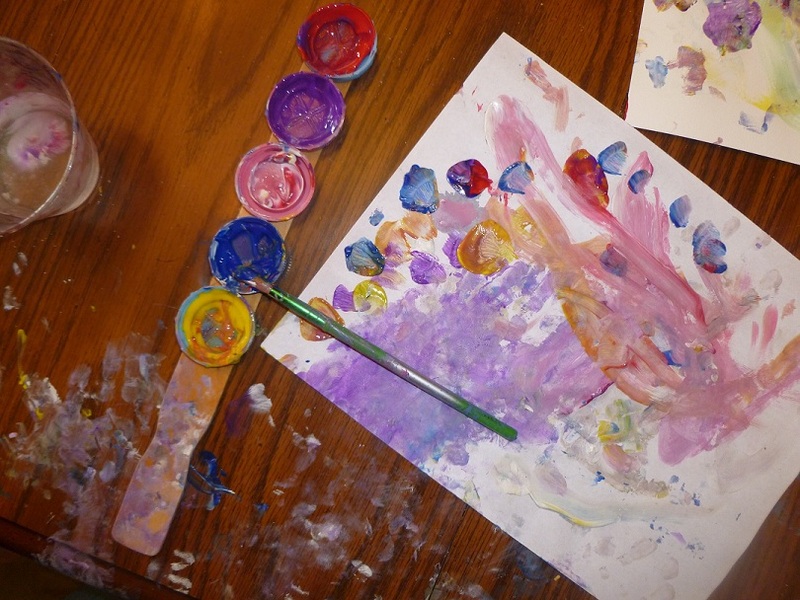 My kids, unfortunately, felt honor-bound to use all the paint in one crafty session. Even if they hadn’t been so determined, their paint-use skills would have dictated that future projects would involve only slightly-varying shades of gray, since they dip and re-dip their paint brushes with no thought to color preservation. I then purchased a bulk pack of tempera paint (much cheaper! ), which I dole in small measure into my makeshift paint trays. After the kids are done making a mess, I rinse ‘em off and store them for next time. My sister-in-law, hearing about my project, decided that her disposable contact lens containers would be even better paint wells, so she used those—brilliant! (If only I still bothered to wear contacts!) At any rate, our milk lids are colorful and they do the job, allowing us to paint multiple times and still maintain color integrity. 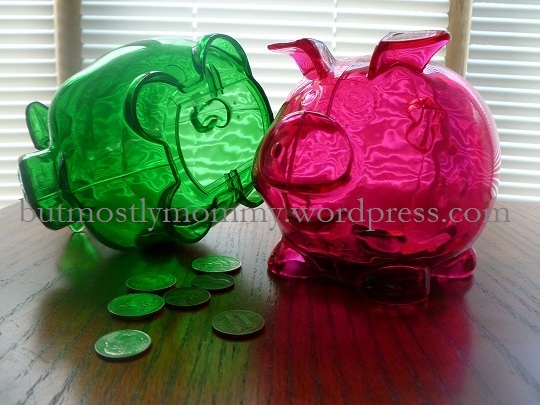 What creative ways have you saved money on kid supplies or adapted to your kids’ needs?